In this Japanese name, the family name is Satō. 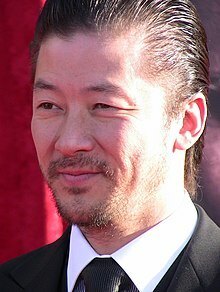 Tadanobu Satō (佐藤 忠信, Satō Tadanobu, born November 27, 1973), better known by his stage name Tadanobu Asano (浅野 忠信, Asano Tadanobu), is a Japanese actor and musician. He is known for his roles as Dragon Eye Morrison in Electric Dragon 80.000 V, Kakihara in Ichi the Killer, Mamoru Arita in Bright Future, Hattori Genosuke in Zatoichi, Kenji in Last Life in the Universe, A man in Survive Style 5+, Ayano in The Taste of Tea, Temujin in Mongol, Captain Yugi Nagata in Battleship, Lord Kira Yoshinaka in the 47 Ronin, and Hogun in the Marvel Cinematic Universe, based on the Marvel Comics character. In 2016, he appeared as the Interpreter in Martin Scorsese's Silence. Asano was born in the Honmoku area of Yokohama to artist Yukihisa Satō (佐藤 幸久, Satō Yukihisa) and mother Junko (順子) whose father was Willard Overing, a U.S. citizen, whom Asano never met. He has Norwegian and Dutch ancestry through this maternal grandfather. Asano has an older brother, Kujun Satō, born in 1971, who is a musician and a partner in Anore Inc., a talent agency Asano and their father Yukihisa Satō founded. His father, an actors' agent, suggested he take on his first acting role in the TV show Kinpachi Sensei at the age of 16. His film debut was in the 1990 Swimming Upstream (Bataashi Kingyo), though his first major critical success was in Shunji Iwai's Fried Dragon Fish (1993). His first critical success internationally was Hirokazu Koreeda's Maboroshi no Hikari (1995), in which he played a man who inexplicably throws himself in front of a train, widowing his wife and orphaning his infant son. He also worked with Koreeda in the pseudo-documentary Distance in 2001. His best known works internationally are the samurai films Gohatto (aka Taboo, 1999) and Zatoichi (2003), as well as the critically acclaimed Bright Future. In addition to his acting career, Asano directed commercial TV spots for his then-wife, Chara. He is a musician; he formed the band MACH-1.67 with director Sogo Ishii in 1996 and, from time to time, plays in the bands Peace Pill and Safari. He is an artist and a model, most notably for Japanese fashion designers Jun Takahashi and Takeo Kikuchi, for whom he filmed a series of commercial spots directed by Wong Kar-wai: one released under the name "wkw/tk/1996@7'55"hk.net". Asano and his father run the actor's agency Anore Inc. which represents Japanese actors like Ryō Kase and Rinko Kikuchi. Asano met J-Pop idol Chara on the set of Iwai's Picnic (1994). They were married in March 1995 and Chara became pregnant with their first child, Sumire, who was born on July 4. In 1999, they also had a son. In July 2009, Chara announced on her website that the couple would be getting an amicable divorce. She received custody of both their children. He won the Most Popular Performer award at the 1997 Japanese Academy Awards for Acri and was nominated in the Best Supporting Actor category in 2004 for his performance in Zatôichi. He also received the Upstream Prize for Best Actor at the 2003 Venice Film Festival for his role in Last Life in the Universe. In 2014 he won the award for Best Actor at the 36th Moscow International Film Festival for his role in My Man. ^ a b c "Tokyo Psycho". Time Magazine. October 21, 2002. Retrieved 2012-11-30. ^ Golovnina, Maria (January 25, 2008). "Mongol actress from soldier dreams to Oscar buzz". The San Diego Union-Tribune. Retrieved 10 November 2008. ^ Hadfield, James (July 7, 2011). "Tadanobu Asano: The Interview". Time Out Tokyo. Archived from the original on 25 January 2012. Retrieved 7 July 2011. ^ "Thor Update: Warriors Three Cast". Marvel.com. 2009-11-16. Retrieved 2009-11-16. ^ Clark, Noelene (2012-08-02). "'Thor: The Dark World': Christopher Eccleston is villain Malekith". Los Angeles Times. Archived from the original on 2012-08-22. Retrieved 2012-08-22. ^ "Thor: Ragnarok Press Kit" (PDF). Walt Disney Studios Motion Pictures. Archived (PDF) from the original on October 9, 2017. Retrieved October 25, 2017. ^ Donat, Begoña (January 30, 2004). "Johnny Depp tiene un primo japonés (Johnny Depp has a Japanese Cousin)" (in Spanish). El Mundo. Retrieved October 28, 2008. ^ Mes, Tom (June 24, 2002). "Tadanobu Asano". Midnight Eye. Retrieved October 28, 2008. ^ Wallace, Bruce (June 13, 2008). "12th century leader, 21st century ideas". Los Angeles Times. Retrieved October 28, 2008. ^ "Wayback Machine". web.archive.org. 9 November 2000. ^ "Tadanobu Asano, Chara divorce". Tokyograph. July 24, 2009. Retrieved 17 October 2009. ^ Riggs, Thomas (2007). Contemporary Theatre, Film & Television. Gale Cengage Learning. p. 7. ISBN 0-7876-9050-3. ^ "36 MIFF Prizes". MIFF. Retrieved 3 July 2014. Morris, Jerome C. "I’m Not as Whacked Out as Dragon Eye Morrison" (interview), in Asian Cult Cinema, #54. Wikimedia Commons has media related to Tadanobu Asano. ^ "Thor: Ragnarok Press Kit" (PDF). Walt Disney Studios Motion Pictures. Archived (PDF) from the original on October 9, 2017. Retrieved October 9, 2017.